Art is one of the best ways to decorate, impress, and engage through relentless creativity. When you can infuse this trait in your walls, it transforms the entire setting. 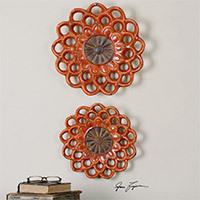 Being home décor artists, we understand which kind of wall art is best suited for a particular kind of ambiance. We use this experience to constantly refine our collection, ensuring you get the best, most exclusive options only. Equally useful for the home or office, these Wall Art Décor items are the best way to make your ambiance look different from the usual. We offer an amazing collection of Wall Art Décor that are not only highly imaginative but also offer a visual treat for those who understand / pursue artistic creations. This includes an innovative range of artifacts made of the finest woods, high-grade metals, and precious ceramics, blending skillful artwork with durability. Passionately handcrafted, this is the widest online collection of home décor artworks. Some of the bestselling options among our Wall Art Décor collection include: Metal Tulips Wall Art and the Rennick Reclaimed Wood Wall Art. Wall Art Decor There are 90 products.